Traduttrice e Insegnante con esperienza ventennale, sono specializzata in traduzioni legali e manualistica da inglese, francese, spagnolo e neerlandese verso italiano, e da inglese, italiano verso francese. Insegnante di italiano, inglese e francese. 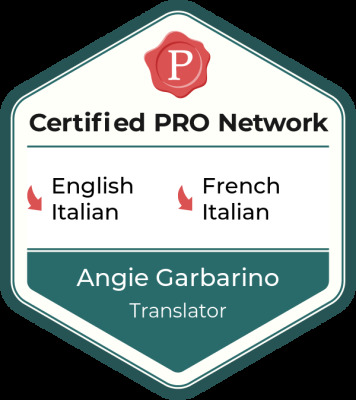 Translator and Teacher with more than 20 years of experience, I am specialized in Legal Translations and Manuals from English, French, Spanish and Dutch to Italian and from English, Italian to French. Teacher of Italian, English and French. Site Guide and Mentor at ProZ.com the largest web site for languages on the planet.